Yoho National Park is one of most beautiful places I have been in Canada. Especially lake O’Hara. 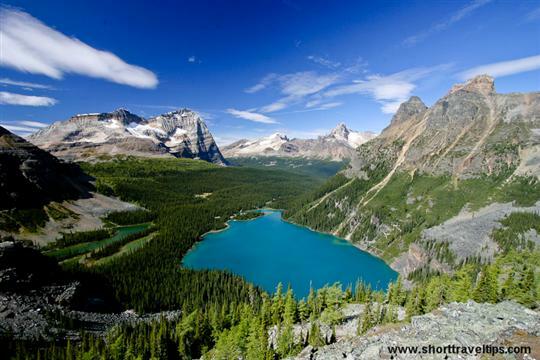 With plenty of short hiking opportunities at Lake O’Hara it is the place everybody must to visit while they come to Alberta province in Canada. This photo only proves that the place is a good place for cabin vacation or even some camping or hiking adventure. Wow! What a beautiful photograph – with so many striking colors. The blues of the sky and the lake pop against the gray and brown of the mountain. The greenery of the trees frames the lake quite nicely. Good work! Wow — that’s beautiful shot of the lake and mountains. I’ll have to put Yoho on my itinerary sometime!